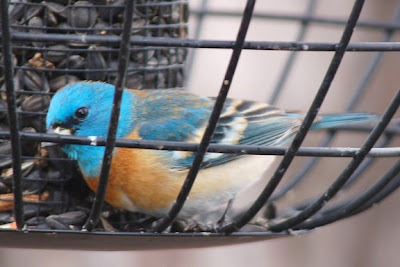 This past week, a sure sign of spring migration turned up at my bird feeder. The Lazuli Bunting is one of our most beautiful western birds, with its bright blue head and back, white wing bars, cinnamon breast, and white belly. It is a summer resident of Baker County. The three males were too alert to get a good picture of, flying off at the slightest hint of the human form, but I was able to photograph at least one in the feeder. Brightens up the gloomiest rainy day. It was probably on its way to one of our local brushy riparian areas at slightly higher elevation in the foothills. This next weekend (May 10 & 11) is the annual spring migration bird count for International Migratory Bird Day. You can learn about International Migratory Bird Day at http://www.birdday.org/ . We Baker birders split up the county and count the different bird species along our routes. The migration has been going on for well over a month, and most summer residents have returned to Baker County and NE Oregon, although some have yet to arrive due to the lingering cold weather. Others have passed through on their way north to breeding grounds in Canada and Alaska, some flying as far as the Arctic Circle. If you would like to participate in the bird count, please contact Joanne Britton at 523-5666 or by e-mail at jobr@oregontrail.net . Below are some photos of a few birds who have already passed through or have arrived for the summer breeding season. In March and early April, we had Tundra Swans, Snow geese and Greater White-fronted geese passing through on their way to their Arctic breeding grounds. We've also had many other water fowl passing through or settling in, including Common Loons and over 16 species of ducks, including Mallard, Pintails, Gadwall, Widgeons, Shovelers, Teal, Scaup, Ring-Necked, Redheads, Canvasbacks, two different Goldeneyes, and the common Merganser. Union and Baker Counties are near the northern extreme of the range for the Great Egret, which is related to the slightly larger, and more common, Great Blue Heron. They were once threatened by over-hunting because of the value of their beautiful “plume” feathers. The photo below was taken last week at Ladd Marsh, in Union County. Another large wading bird in the same genus as the Great Egret is the Great Blue Heron. They are quite common throughout North East Oregon in the spring and summer, with a few remaining year round. A heron rookery (group nesting site) can be seen in the Salmon Creek area near Pocahontas Road. Another Baker County migrant of cat-tail marsh areas is the Virginia Rail. Due to their solitary and secretive lifestyle, this rail is not often seen, even though present nearby. This photo was taken at Ladd Marsh on May 1st. Right now, our three blackbirds are back at their stations, in the valley and at feeders. The yellow-headed is hanging on to the remaining small patches and threads of wetlands with cat-tail communities which are used as breeding habitat. The males are here now collecting in colonies and the females will arrive any day, if they haven’t already. To continue to have them in Baker Valley, emergent deeper water cat-tail wetlands should be preserved and expanded on public land or on conservation easements. Long-billed Curlews have made their appearance too in low grasslands and alfalfa fields. This is the largest sandpiper and one of the most imperiled shorebirds in the world. Its population has declined dramatically since the middle of the 1800s due to historic hunting and loss of both wintering and breeding habitat. It is listed as "vulnerable" in Oregon. The one below was in a short grass field near Schetky Road. The Lincoln's Sparrow is not often seen in Baker County, but is said to be fairly common in weeds and brush during migration. It migrates from the south to southern Alaska and much of Canada, and breeds largely in the boreal forests, generally near water. 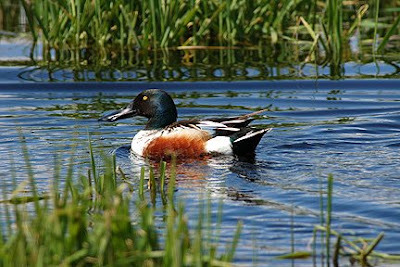 It is also resident in the Cascades and possibly the Blue Mountains, as it has been heard at Anthony Lake. It looks like a delicate version of the common Song Sparrow. As with many other migrants and neo-tropical songbirds, cattle grazing along streams and rivers interferes with breeding success and destroys breeding habitat. The bird in the photo below was seen a week or so ago along Lindley Road. Another Sparrow that has returned in the last week or two is the White-crowned Sparrow. It is often seen scratching out a living on the ground, chicken-like, looking for seeds and small insects. This handsome and sporty sparrow is still quite common in most of its range but may be declining in some areas of the west. It breeds in boreal forest, tundra and alpine meadows in most of its breeding range, which includes western and northern Canada, Alaska, and the northern Rockies. It is a year around resident in portions of California, north eastern Oregon, and the intermountain states. Out in the sage brush, both Brewer's Sparrows and Sage Sparrows have returned, as have the Sage Thrashers. The Brewer's is a drab sparrow with a marvelous song. The Sage Sparrow is another somewhat inconspicuous, and often unnoticed, gray-headed sparrow of the taller sagebrush, often found on the ground seeking out seeds and insects. It is a candidate species in Washington State due to the fragmentation and destruction of its sagebrush habitat by farmers, cattle ranchers and OHV recreationists. It faces similar threats in Baker County, especially from private development of sagebrush communities and the creation of the OHV area near Virtue Flat. The Sage Thrashers are dependent on sagebrush communities and have habitat requirements similar to the Sage Sparrow, but require more dense habitat with greater cover. It too is a candidate species in Washington, and faces the same threats in Baker County as those of the Sage Sparrow. It can sometimes be seen in the morning along the fence line on the north side of Highway 86 between the Oregon Trail Memorial and the Oregon Trail Visitors Center. According to BLM documents, the sagebrush community on the north side of the road has been protected from grazing for a number of years. It can sometimes be found elsewhere, as along the east side of Schetky Road, with Brewer's Sparrow, and the latter can be found in the sagebrush around Bowen Valley, south of Baker City. A common migratory bird of open fields and hot dry sagebrush country is the Western Kingbird. It is often seen perched on a wire or fencepost, from which it flies out to catch an insect in midair. Lastly, for now, the Swainson's and Ferruginous Hawks, as well as the Osprey's (Fish Eagles) have returned to the area. Swainson's is somewhat common from portions of the city to the valley, and the Ferruginous is uncommonly found where fields meet sagebrush communities and beyond. It is more common in the southern portions of the county. The Osprey can be viewed fishing at Anthony Lakes and at the several man-made nest platforms in the valley and up around Phillips Reservoir. There are also natural nest sites in the forest, as the one close to the dam at Phillips Reservoir. A picture of the Swainson's can be seen in my 12/22/07 blog in the wolves and "death to the rodents" article. A photo of Mom & Pop Osprey is below, with little chick to left in nest. The mother is the larger bird on the right, which is always the case with Ospreys. It just goes to show you, that in nature, things don't always fit the anthropocentric or unimaginative model. Nature selects what works for survival in particular environmental conditions and periods of time. I hope you enjoyed these photos as much as I did getting out to take them. 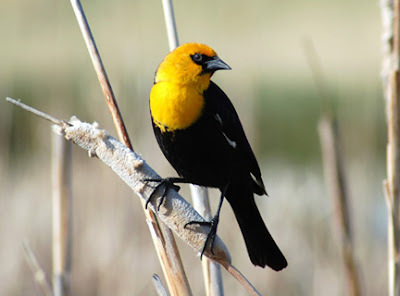 I gave the swan and the Yellow-headed Black bird photos to the Baker City Herald for free when they requested a few photos for the Baker County Travel Guide birding section, but they chose not to use them. Perhaps my politics got in the way. Compare, and then you can be the judge. In Baker City or County, you may have Barn Owls visit your yard, and you can find them in some local buildings. "You call someplace paradise, kiss it goodbye." When I was a youngster in Southern California, I could walk to the wildland interface in the washes and chaparral communities on the north end of the city in about an hour. A certain degree of wild nature was within reach and greatly appreciated by my friends and I. We especially enjoyed watching the tadpoles turn into hundreds of happily hopping toads in late spring. By the time I got out of the Army and was attending college, those valued wild places had been bulldozed over and replaced with "ticky-tacky" housing tracts, and most of the citrus groves and grape vineyards I also had known were experiencing the same fate. Smog was enveloping the once clear and beautiful valley as well as the surrounding mountains, which could only be seen clearly during "Santa Ana" winds and after winter storms. After college, I permanently left that place and sought shelter first at the ocean in San Diego, and then along a quiet country road in the peaceful foothills not far from the Mexican Border. Red-shouldered hawks inhabited the open spaces across the road from my house. Twenty plus years later my childhood home town had become almost unrecognizable and my haven in the hills had been ruined by the development of single family hotels and gated communities. Traffic congestion and smog had come to the hills and water wells were going dry. The Red-shouldered hawks were seen less frequently, and the new residents had turned the quiet country road into a raceway that I entered and exited at my own risk. By then, Joni Mitchell had written "Big Yellow Taxi" ("They paved paradise And put up a parking lot") and the Eagles had graced us with "The Last Resort:"
They even brought a neon sign: "Jesus is coming"
You call someplace paradise, kiss it goodbye "
I loved that melancholy song because it told much of the sad and bitter truth that I and so many others had experienced in California. The only thing they left out was the millions of immigrants, legal and illegal, that had arrived from other states and foreign lands, mostly from Mexico and points south. The first waves during my lifetime were Americans who had come from the eastern US, from places like Chicago and Buffalo, but from about 1970 onward, the waves, more like an enduring tsunami, came primarily from south of the border. When I was born, almost 60 years ago, there were fewer than 147 million people in the US and around 10 million in California. Now there are around 38 million people in California (almost quadrupled) and an estimated 304 million and climbing in the US (a doubling). The earth's population went from around 2.5 billion to an estimated 6.7 billion during the same period. Is it really any wonder we are beginning to see resource scarcity all around? Paul Ehrlich's much maligned "Population Bomb" was written in 1968. I listened to him speak about the population explosion that year at my community college. The Club of Rome warnings were sounded in 1972. US population had stabilized in the mid 70's just after our oil production peaked. Immigration law changes in 1965, along with media and business promotion of the philosophies of the Cornucopians, along with fears about having sufficient numbers of folks to support the economic pyramid scheme, set the stage for massive immigration and population increases at the same time our energy supplies and other resources were declining. Instead of US population stabilizing at 250 million, followed by a slow decline, it shot up at tragically unsustainable rates. Today, it seems like Baker County and eastern Oregon is our "paradise," and that could be a bad sign. I was driven from California to Oregon due to population pressures and associated effects, just as many of those who came to California were. Others have done the same in settling here, but we have had negligible effect on population growth because many of us were retired and we moved into existing, unoccupied housing. Here, even with the ecological transformation and habitat destruction produced by agricultural development, there is easy access to the wild and semi-wild, clean air, and clean water, just as in the Southern California of my youth. But without foresight, good fortune, and good planning, we stand to lose it all. Our oh so wise and visionary local leaders, perhaps conflicted by their own business interests and commitment to the Church of Commerce, continue to offer up growth as the cure for economic stagnation (also known as sustainability) or decline, without fully explaining, or perhaps even understanding, what the full costs of that growth will be. The miracle of "prosperity" can be yours--just open up your hearts and pocketbooks to fee and tax increases, pay for expensive expansions to your infrastructure, improve the airport for the rich, make Baker look good to the wealthy people of Portland and San Jose, and "the good life" will be just around the corner. But more on that in a future post. 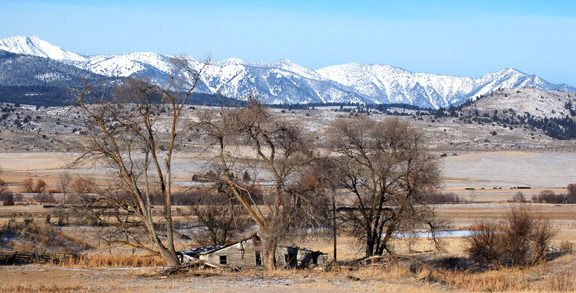 For myself, I prefer keeping Baker City like it is. We are fortunate to have our nearby wildflowers, local birds and other wildlife (well, it would be nice if the deer stayed off the fruit trees and out of the garden), along with our relatively clean air and water. I know what growth will bring, and it makes economic stagnation (sustainability) look pretty good when all is said and done. Perhaps good fortune will save us the fate of other pieces of paradise—who knows? The cursedly cold winters may be a blessing in disguise in the face of peak oil and a prolonged decline in energy resources. If I believed in the efficacy of prayer to achieve an end, I would be praying for the winter to be our saving grace, but cold winters didn’t save Bend, Oregon from the ravages of development. "You call someplace paradise, kiss it goodbye."